Someone is celebrating her birthday this month. Anyway, so we're wishing her a happy birfday today cuz Mommy made us. Dude, Allie's bigger than you. Probably a good idea to do something nice once in a while so's she doesn't whup your tuchus. Doesn't have anything to do with my WAND Toys, does it?!? We're not exactly sure what day Allie was born but Wayside Waifs estimates October of 2008. So, happy birth-month, Little Princess! Allie received a very nice card in the mail yesterday. *horrified look* Maxie...It's from...THE V-E-T!!! Winner of the Flexi-Joints and Omega Glossy Coat Supplement Giveaway! 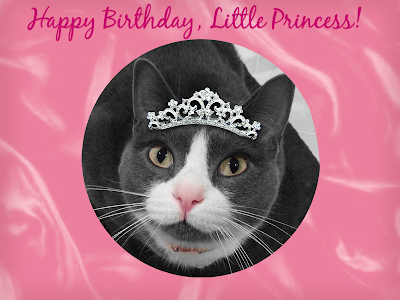 Wish you a HAPPY HAPPY BIRTHDAY , Princess Allie ! Princess Allie, happy birthday! Have a great day full of pets, 'nip, love and treats! Happy Birthday little Princess. We wish you a swell day. Have a super Sunday. Happy birth-month Allie. It's good that you get a long celebration because you have to put up with those meowthy boys all the time. Happy Birthday Allie - we hope you have a great day with lots of presents, hugs and kisses. You look most fetching in your tiara, Allie. All our good wishes for a VERY HAPPY BIRTHDAY! OMC, I can't believe Allie got an ecard from the vet! My human thought it was cool, but I think is a little bit creepy! Happy birthday, Allie! And I hope that you don't have to get any birthday wishes IN PERSON from the vet anytime soon! Happy Birthday Allie. You look very pretty in your tiara. Happy Birthday Allie! Make sure the boys all do your bidding today! Happy Birthday to Princess Allie!!!!! Happy Birthday from all of us!!! Happy Birthday, Princess--you keep those boys in line! Happy Birthday Allie!! Hope you had a fun day! A very happy Birthday to you Allie. We sure hope you have a great day and many more of them. Be sure to watch those boys and make them behave. Have a good one. Take care. Happy, happy birthday beautiful Allie! Happy, Happy, Happy Birthday to you Princess Allie! Happy Birthday, Allie! What a fun card you got!! Allie! Yous is the bestest Acolyte ever! Me has comed by to sing yous the birthday song! Oh dear Cod, NOOOOOOOOOOOOO! From the V-E-T?? At the ::shhhhh:: Stabby Place???? That's the most horrifying thing I have efur heard! P.S. - Hi Faraday and Maxwell! ALLIE!!!!!! Glogirly was at BARKworld and made me miss your birthday! Don't worry, she's gonna PAY. Hope you had a perfect day and those two *other* cats were nice to you. I don't want to have to come over there. ps - that video card is HILARIOUS! ...and scary, given it came from the V-E-T. Happy Belated Birthday Dear Allie! And many more...I'z got my jazz paws going for ya bigtime beautiful lady! Hope your whole B-day month was great!